The Title "Electromagnetic Fields (Theory and Problems)" is written by T.V.S. Arun Murthy. This book was published in the year 2012. The ISBN number 8121929962|9788121929967 is assigned to the Paperback version of this title. This book has total of pp. xvi + 475 + 4 (Pages). The publisher of this title is S. Chand & Company Ltd.. We have about 1978 other great books from this publisher. 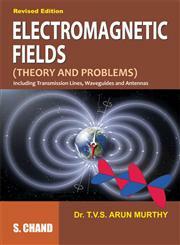 Electromagnetic Fields (Theory and Problems) is currently Available with us.